Lyssa Peate is living double lives as a planet-discovering scientist and space pirate bounty hunter. Unfortunately, neither life is going so hot. As the space pirate, she’s one of the least wanted people in the universe, and as the scientist, her new intern is definitely spying on her. Things get worse when that intern is mistaken for her hostage by the universal police. Get the entire Razia series for just $0.99 today only! 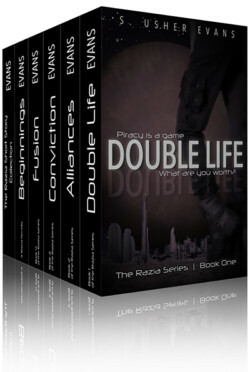 Includes four full-length novels, seven short stories, and a prequel novella.